A playable character with a PawnNoiseEmitter component, which will be used to “report” into the game that a sound has been played. 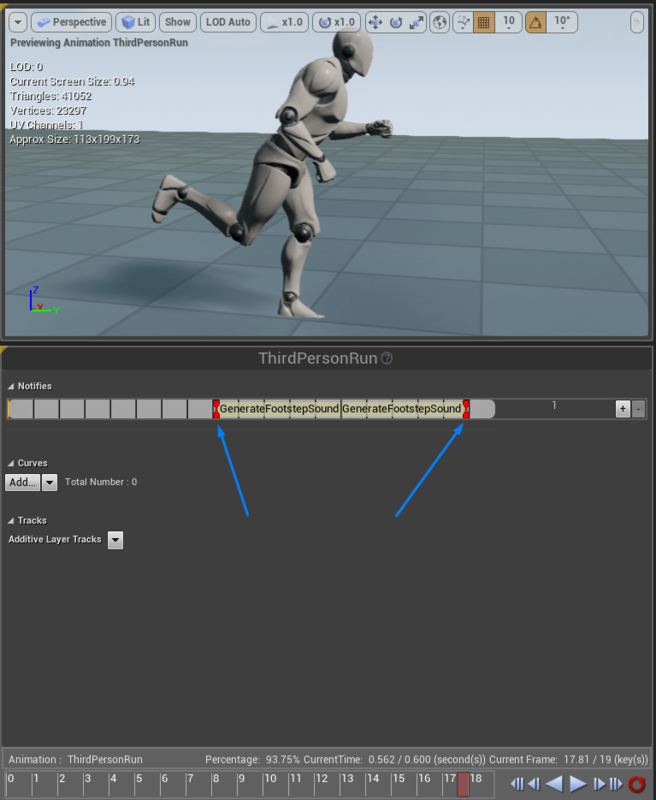 While reading this list you will notice that the footsteps sound is optional, this is because in UE4 we explicitly tell the game that we’ve played a sound somewhere with a certain volume. The engine itself doesn’t care if we have actually played a sound or not. In case you want to include the same footstep sound I’ve used in the video above, here is the download link. In order to get started, create a Third Person C++ Template project. Before we even begin to write any code, right when your template project loads up, add a nav mesh bounds volume to cover your whole level! Character's Pawn Noise Emitter Component Init. Note here we’re doing two things. We first play the given sound and then we’re using the built-in function MakeNoise to inform our game that we have played a sound. In case you copy and pasted the code above don’t forget to edit my Character’s class name to match yours. Now that we’re done with our character’s C++ logic and what we need to tell our character to play a sound when he touches the floor. To do that we’re going to use Animation Notifies. Think of Animation Notifies like functions, which get called in a specific frame of an animation that we decide. For more information about them, check out the official UE4 documentation. Notice that I imported the sound I’ve mentioned above and I have hardcoded its reference for the given function. 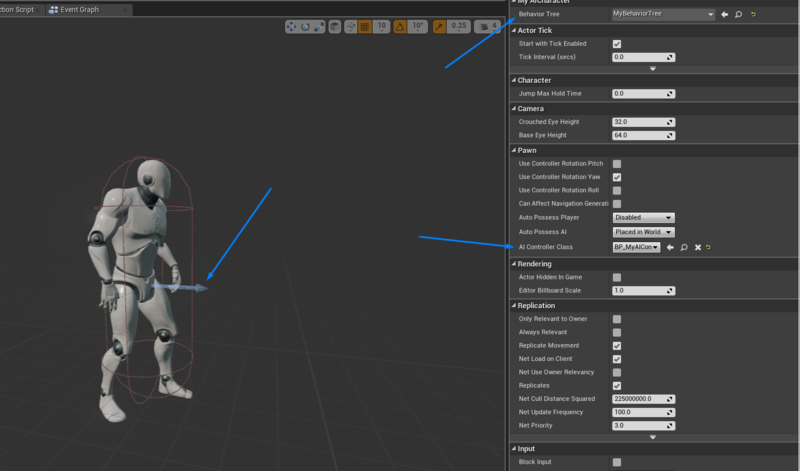 It would be more flexible to create a separate USoundBase* property inside the Character’s header file and assign values through its Blueprint. However, in this case, this is adequate. Compile and save your Blueprint. If you play with your Character right now, you will hear the generated sounds for each footstep! Let’s move on! //Updates our target based on what we've heard. You will notice that inside the OnHearNoise function I’ve commented out the lines 28 and 34. This is because we have yet to add our AI Controller class. When we’re done with our Controller, we’ll get back and uncomment that code. For now, just compile and save your code. #include "BehaviorTree/BehaviorTree.h" #include "BehaviorTree/BehaviorTreeComponent.h" #include "BehaviorTree/BlackboardComponent.h"
/*This property is used to find a certain key for our blackboard. Compile and save your code. Since we don’t want a “Seeing” sense for our AI, locate it’s PawnSensingComponent and disable the See Pawns option. This is crucial. Our blackboard setup is simple, add a new Object key named SensedPawn. Moreover, click on the MoveActor node and set the acceptable radius to 100 and the Blackboard Key to SensedPawn. Save your project and place an AI Character inside your map. The AI should now follow you like the video I’ve uploaded above. I have an AI setup going already, it has sight patrol points, deal damge etc. but it is in blueprints only, can I add this C++ to it without breaking my current system? Depending on your actual setup you may need to do some tweaking. Since your entire AI is based on Blueprints you have already a Blueprint Controller and a Blueprint Character. In case you wish to follow my tutorial you need to create a c++ class for both the controller and the character and then reparent your Blueprints (in order to derive from the c++ classes). By doing so, you might encounter strange problems (again, depending on your Blueprint code so far) so things might go sideways. If you’re not feeling safe using C++ I think it would be a better option to implement the whole hearing system using Blueprints (it is do-able and it’s covered in an official UE4 Livestream in their youtube channel somewhere). However, you can always create a backup and revert your project if things go sideways! And I already ran into a problemm, I have I characterBase blueprint that manages damage and managers, but I can’t find a way to let my Enemycharacter have a C++ parent, and let that C++ parent have a characterBase parent, this characterBase is also the parent of my FPSCharacter, so I cant just give that a new parent. I’m a bit confused, do you mean that you have the same parent class for both your playable character and your AI character? Why are you creating a BehaviourTree Component both in the AICharacter and the AIController? Seems like you’re only using it in the AIController (and the way I’ve understood the functionality, you only need it in the Controller). 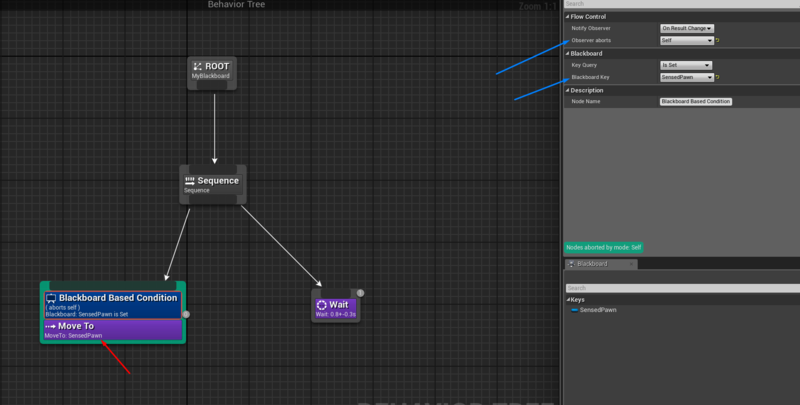 Hello, in the AICharacter I’ve added a Behavior Tree and in the AIController I’ve added a Behavior Tree Component. The Behavior Tree located in the AICharacter contains the actual logic of the AI (notice that we assigned a Behavior Tree in the Blueprint of our character), however the Behavior Tree Component is used in order to kickstart that logic when our controller possesses a pawn. It now works thank you :)… also could you do an AI tutorial envolving EQS? Love the stuff that you put up! Thank you for your kind words and your suggestion! I’ve got an EQS tutorial on my backlog for some time now, so I think that I will take a look into that in the future. I’m trying to build up on your tutorials with more AI logic in which two AI characters make noises and receive each other’s noises, other than the ones that come from the player… but for some reason, they can’t hear each other’s noises! I did everything just like you did but i changed some stuff (instead of calling the ReportNoise function from the AnimBP, i call it from within the AICharacter class, and on the OnHearNoise function of the AICharacter, it also checks to see whether the same class made that noise). Have you checked their Blackboard values in order to make sure that you have the right referenced values? Moreover, make sure that your OnHearNoise and ReportNoise function fire when they supposed to. it worked for me then. I don’t know if Epic Games has changed the API since then but I thought I’d let you know. Awesome tutorial once again, Thank you so much for doing this! You are my favorite Unreal tutorial-maker!